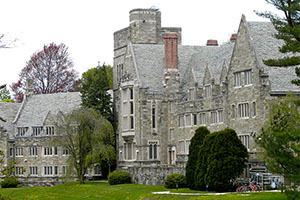 When Bryn Mawr College opened its doors in 1885, it offered women a more ambitious academic program than any previously available to them in the United States. Other women's colleges existed, but Bryn Mawr was the first to offer graduate education through the Ph.D.—a signal of its founders' refusal to accept the limitations imposed on women's intellectual achievement at other institutions. A Bryn Mawr woman is defined by a rare combination of personal characteristics, which include an intense intellectual commitment, a purposeful vision of her life and a desire to make a meaningful contribution to the world. These attributes create a spirit that is palpable on campus.